Selftours Travel Shop, having visited Madagascar on several occasions, have explored the various adventure holidays and different hotels available are now one of the leading tour designers of Madagascar holiday tours. Selftours Travel Shop has been designing Madagascar tours for over 17 years. We have built up our own experienced team of ground handlers in Antananarivo, Diego Suarez, Nosy Be & St Marie, to assist where necessary. 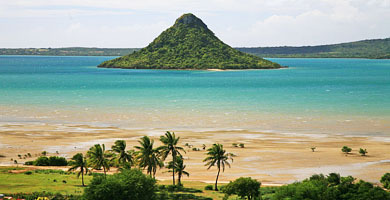 Travel on a Madagascar Island Adventure Holiday and be one of the few to explore this new & exciting mystical island. 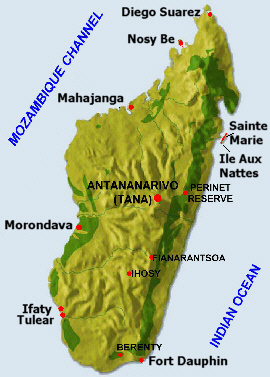 Madagascar island, the world's 4th largest island, measuring approximately 1571 km in length and 571 km across. Because of its isolation most of its wildlife, half its birds, and most of its plants exist nowhere else in the world. Almost everything is strangely different, on the Madagascar island, wildlife, the famous Madagascar hissing Cockroach, the trees, the fauna, the rock formations, everything you'll see and touch on your Madagascar holiday is seldom found anywhere else. The only place in the world where you can see lemurs dancing with their babies in the wild. The Madagascar island also has its share of beautiful beaches and magnificent untouched coral reefs enticing scuba divers and snorkelers into the warm tropical Indian Ocean waters. Madagascar island is a big country where you can return again & again and never see the same place twice. As soon as the road network is restored we intend to start self drive tours of Madagascar. This makes Madagascar holidays unique and a compellingly destination to explore. For holiday makers looking for something new and different in a holiday, a Madagascar holiday is for you. From exploring the unusual features, forests, wildlife, cultures and customs to a relaxing beach holiday in the tropical sunshine. 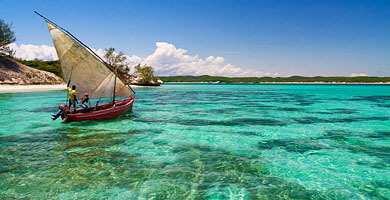 Madagascar has a great deal more to offer than just staying on a beach for a couple of weeks. 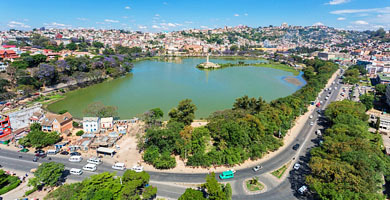 "Tana" as it is affectionately know, is the capitol of Madagascar with a population of 3 million people. Tana is situated in the centre of the island in the highlands 4060 feet above sea level. It is Madagascar's largest city and is the administrative, communications, and economic centre of Madagascar. Built on the hillsides and ridges of 12 sacred hills and surrounded with rice paddy fields, Tana is an interesting place to spend a few days either at the beginning or end of your holiday. Since it is also the location of the country's major international airport, most visitors will find themselves at least passing through the city. There is a Lemur Park with a shop & restaurant just 30 minutes outside Tana which is an ideal park to visit if you are laid over for several hours awaiting your connecting flight. The Artisans Market is also worth a visit where you can 'Haggle' for bargains amongst the colourful local traders. Silk and leather goods abound but do beware of the coloured gems which are usually just coloured glass, or a afternoon City Tour covering the palace and other historical land marks. Lies off the north eastern coast of the main island of Madagascar. 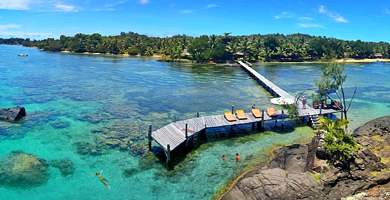 Sainte Marie Island is just 7 kilometres off the coast at its nearest point, and 1 hours flying time from Tana. It is a long thin tropical island approximately 60 km in length and less than 7 km wide with the small island of Ile aux Nattes just off the southern tip. The island has a colourful past as a Pirate's Haven (1680 to 1720) with secluded beaches, soft white sand, warm weather, swaying palms and lush vegetation. 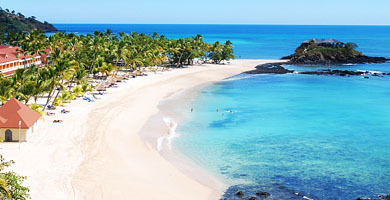 Sainte Marie has for three centuries remained the perfect example of a pristine lush green tropical island. The islands can be visited all year round except during February as this is Sainte Marie's cyclones season. Scuba Diving: Safe from sharks, the lagoon of Sainte Marie island is endowed with significant coralline growth. Its underwater fauna is preserved as a natural heritage and first-class diving site in the Indian ocean. These and the many corals can be explored by both scuba divers and amateurs with little more than a mask, snorkel and a set of fins. Whales: The channel between Sainte-Marie and Madagascar is a hot spot for whale watching. Between July through to September substantial groups of humpback whales migrate from the Antarctic to this idyllic breeding place. These quiet giants find conditions here that are favourable for the growth of their young and well suited to their courtship and acrobatic games before the big return south towards the colder seas of Antarctica. Meaning the "Big Island" in the Nosy Be Archipelago. Also know as the perfume island due to the large cultivations and processing of Ylang Ylang. Situated off the North West coast of Madagascar, with a surface area of approx 280 sq km. including numerous smaller surrounding islands. It is a volcanic island with eleven extinct volcanoes which now act as natural water reservoirs for both cultivation and human consumption. Some are also home to crocodiles. The highest peak, Mount Passot rises to 450m. 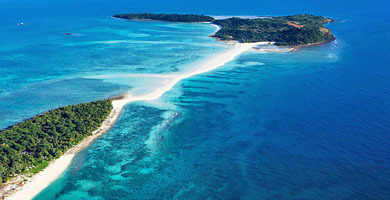 It’s tropical climate and classical ‘Indian Ocean holiday island’ appeal makes it a leading sea, sun & sand destination. It boasts 12 months of sunshine, exuberant tropical vegetation, with beautiful beaches washed by the warm waters of the Mozambique Channel. Scuba Diving: A popular attraction as there are many coral reef to explore with several scuba diving operation on the island. Nosy Sakatia 2km off the northwest coast of Nosy Be specialises in Scuba Diving. A day excursion to Nosy Komba, the Lemur island, where lemurs and villagers live in harmony. Then on to nearby Nosy Tanikely where you can relax on a beautiful beach, take a small hike up to the light house or snorkel right off the beach. A tasty picnic lunch is served on the beach under the watchful eye of the friendly but curious lemur colony. Nosy Tanikely's beautiful coral has been declared a marine sanctuary. This tour is a must. There’s also the Lokobe Reserve nature trail, on southeast Nosy Be. The islands can be visited all year except during February, as then the rains peak. Yacht Charter packages are also available. Situated centrally on the west coast of Madagascar at the mouth of the Morondava River and washed by the warm waters of the Mozambique Channel, Morondava is accessed by direct flights from Antananarivo and Fort Dauphin. Reminiscent of a 'wild west' movie set, Morondava is the centre of the Sakalava kingdom and their tombs. 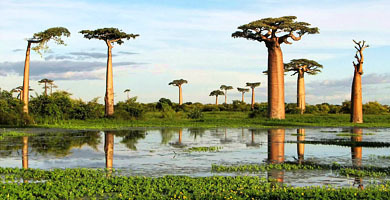 The Morondava basin is baobab country and is the gateway to many of the wonders of the western region including the Kirindy Forest, the Avenue of the Baobabs, the Tsingy de Bemaraha, Belo Sur Mer, and famous for its river rafting expeditions. Morondava offers sandy streets and vast seashores rocked by the passage of schooners and pirogues with their sails filled by the wind. Fishing is the main activity of Morondava, pulsating with the ancient rhythms of the Vezo fishermen. Shrimp is called pink gold here, sustaining many families since the opening of a processing factory. Tailor-made action-packed river expeditions for the adventurous, can range from one to several days to suit you. Canoeing down the meandering rivers of the region is the ideal avenue to reach natural unspoiled places, and makes for wonderfully civilized camping. How much closer can you get to nature? 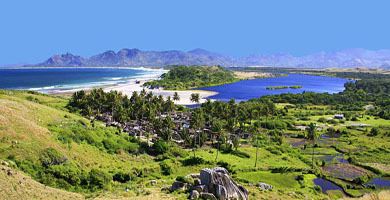 When one thinks of Fort Dauphin one things of Berenty Private Lemur Reserve and its diverse Madagascar wildlife. Fort Dauphin is situated in the south east corner and enjoys direct flights from Johannesburg due to the South African mining operation in the area. 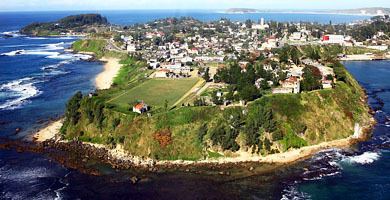 Two main attraction are both Berenty and Lokora beach. Lokora: Excursions to Lokora beach is by fast motor boat travelling east through very scenic natural botanical gardens in a semi swamp land running parallel, but inland, to the coast line. A short hike over the hill with breath taking views leads you down to Lokora beach. En route view large elephant ear plants, insect eating plants, village culture, outstanding views. Lunch is served on a lovely beach next to a local fishing village. A great day of experiences. Berenty: The 2 hour drive up from Fort Dauphin introduces you to the strange Spiny forest trees, and large Baobabs. Almost all trees in this area are heavily encrusted with spines & thorns to ensure their survival in the dry climate. The reserve borders the Mandare river and is the world’s largest Lemur reserve, and home to six different species of Lemurs. 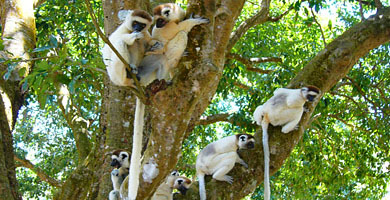 The famous dancing Lemurs, the Sifaka, are common in the park. You can choose to drive up from Fort Dauphin for the day, or, if you decide to spend the night you can also enjoy spotting the nocturnal Lemurs after dark. Binoculars and a torch are a recommended accessory. The 12 000 hectare rainforest of Perinet is situated approximately 3 hours east of Antananarivo making it one of the country’s most popular Madagascar wildlife reserve. 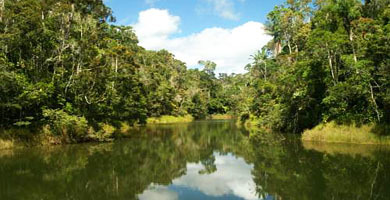 Be in the rainforest as close to daybreak as possible as the animals are most active in the early morning. The trails are not difficult to manage and most of the forest guides speak English. Perinet holds a large variety of rare rainforest plants and animals including eleven species of lemur (most notably the baboon-sized Indri with its haunting call and elusive habits), the large parsons chameleon, the blue boa constrictor, a large variety of tropical birds, Orchids, and other epiphytes festoon the trees. 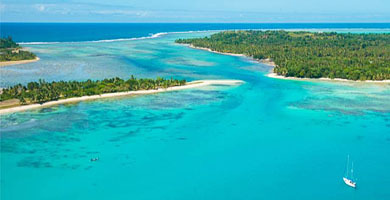 Suggestion: Consider our Pangalanes Canal Tour - by road down to Perinet then boat trip up the canal (loads of culture, wildlife & scenery along the canal), then crossing to the Pirate island of Sainte Marie for that relaxation in the sun. The northern tip of Madagascar which saw conflict in both the world wars as can be witnessed from the artillery emplacements to the entrance to the bay and in the British, French and Malagasy war cemetery's. Diego is situated on the second largest bay in the world and a strategic safe deep harbour to shipping with dry docks and other shipping services. Red Tsingy, a more delicate and very unusual version on the Grey limestone Tsingy, found uniquely in several areas of Madagascar - the red Tsingy are made of sandstone and present beautiful forms. Amber Mountain is a long-extinct volcano covered by primary tropical rainforest, including craters and waterfalls. A bewildering array of animals and plants have specially adapted to thrive in this moist 'island' of biological diversity. Lemurs, birds, chameleons, geckos, and truly immense rain forest trees, are among some of the natural wonders you will encounter. 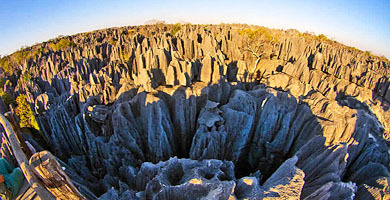 Suggestion: consider the best of both - our Diego Suarez Tsingy Tour runs down through the Tsingy & forests to Nosy Be for some final beach relaxation. Visas - Travel in Madagascar. Madagascar has recently reintroduce visa requirements. Visas can be obtained on arrival and cost approx Euros 25per person. It is recommended that you obtain an amount of Euros in cash from your bankers before departure. A valid passport is naturally with a minimum of at least 2 clean pages. Currency - As soon as you have cleared through customs, change some money into Ariary at the airport Bureau de Charge. Any currency not used can be converted back into Euros prior to leaving Madagascar at the airport Bureau de Charge. Do not take South African Rand to Madagascar. Credit Cards: MasterCard is rarely accepted, recommend you take a Visa Card as most hotels happily accept Visa. Tipping - be careful not to be persuaded or bullied into over tipping. The average porter at the airport only earns approximately 20000 Ariary a week (about US $12) They have been known to ask for 10000 Ariary just to push your trolley. At tip of 1000 Aries would be considered reasonable. When to go - This depends on your interest. Nature enthusiasts should go from late August to January. Certain parts of western Madagascar are not accessible in summer (December - March) after rains. Avoid the northeast in February, Cyclones may occur in January to March on the East coast. July to September is also good for whale watching on the east coast. 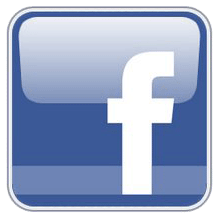 Health requirements - No immunizations are necessary. Malaria prophylactics are essential. Drink only bottled water or take water purification tablets. Travel insurance - is recommended as it covers medical, injury, lost luggage, flights cancellation etc. Ask Selftours for more info. Customs allowance - 500 cigarettes and 1 litre of alcohol. What to pack - Comfortable, casual and light clothing, a fleece track suit is an ideal all-round item, warm, keeps any bugs away from you, does not get crumpled in a suit case and is always presentable. Well-worn walking shoes or sneakers/trainers are essential. Pack warm clothing for winter nights. Take insect repellent and protective wear for the tropical sun and rain. If visiting Perinet Lemur forest a Dry Mac is recommended as the rainy season is all year round and it can be chilly in the evenings. If planning an evening walk in the forests, to spot nocturnal animals, a head mounted torch is an excellent accessory. A small back-pack is always ideal for carrying your small personal items. A small basic medical kit is a wise idea, especially if you are intending to travel through Forests, canals and unpopulated areas far from major towns. Should you need to purchase medicines from a chemist the packet will most likely be printed in French, this can be frustrating if you are non French speaking. Rather carry a supply of headache pills etc with you. When travelling all medication should be carried in the original packaging for identification purposes if checked by customs. For chronic medication you may be asked for a copy of your doctors prescription as proof that you are authorised to carry such drugs. Luggage allowance - 20 kg & 1 item of hand luggage. Language - Malagasy is the first language; French the business language and English is spoken by many people in the tourism industry. An English to French phrase book could be your best companion if you are not familiar with speaking French. If not sold out, Exclusive Books, in Jhb Airport duty free area stock them. Getting there - Airlink in South Africa currently offer a Sunday flight directly from Johannesburg to Nosy Be Island in the North. (main tourist area) With selected Wednesday flights in busy periods. 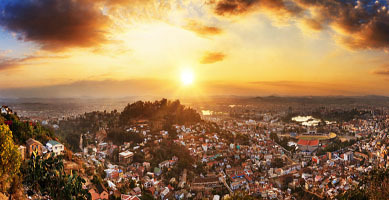 A daily flight operates from Johannesburg to the capital Antananarivo. Flight duration is three hours. Getting around - The most comfortable method is to fly to domestic destinations. Air Madagascar serves 60 domestic airports. There are overland routes run by a few operators but due to the road conditions these can take a few days rather than a few hours and would involve over night stops. Airport transfers are arranged by Selftours to and from your hotel. The Malagasy transport department has put rebuilding roads on their priority list. Selftours does not recommend self-drive as the infrastructure is not yet in place, petrol station etc. Traditions, customs and taboos - There are many taboos and traditions in Madagascar and if your guide asks you not to point your finger or photograph a tombs etc, please respect there wishes. If in doubt always ask permission before taking photographs. Standards - Travellers to Madagascar must understand that Madagascar is fairly new to the international tourist market, hence the Madagascar hotel accommodation standard, though good, may not be up to the same international accommodation standards that you would expect in South Africa or Europe. We at Selftours believe that this only adds to the mystic of the island of Madagascar.